2014 was a strong year for the British retail sector, with consumer demand (private consumption increased 2.3%) being one of the primary drivers for the 2.6% GDP growth. Consumer confidence and discretionary income have shown significant improvement over the past 12 months. The overall trend in consumer durables retail performance over the past 18 months has been an improving one, with like-for-like sales increasing. One driver of demand in household appliances has been the recent pick up in housing activity. 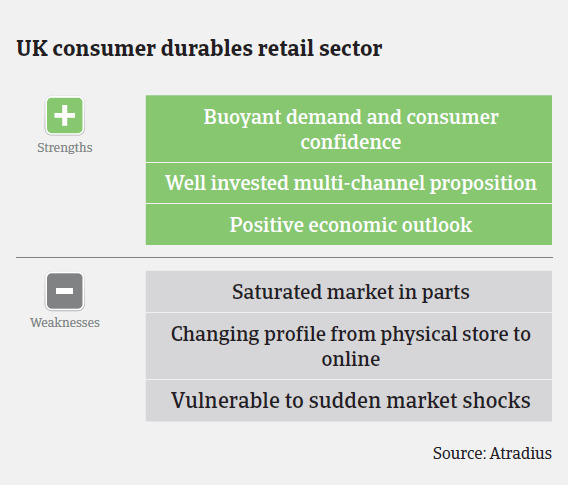 Given the current forecast of 3.1% private consumption increase and 2.7% GDP growth, it is expected that consumer durables retail will perform well in 2015. However, there are also concerns over whether this rebound will continue as real wages stagnate. The retail sector experienced extremely difficult business conditions during the economic downturn with high insolvency numbers, as many companies could not cope with the adverse business environment, often due to an unprofitable store portfolio that retailers were unable to downsize. And while the economic downturn has been overcome, it has nevertheless changed the way many consumers shop today - with greater price sensitivity, and an increasing reluctance to purchase ‘big-ticket’-items. Margin pressure remains an issue for many businesses, and the key to success is being able to sell stock as close to full price as possible. There will of course be periods in which retail businesses will have to be on ‘seasonal sale’, but the ability to keep these periods to a minimum is key. A major area of discussion in recent months has been the performance of the major British supermarket chains. German discounters Aldi and Lidl have grown rapidly in the past two years, as their low-cost no-frills convenience model has become very popular with British consumers. Large British retailers such as Tesco, Asda, Sainsbury’s and Morrison’s have struggled to adapt to this, with their large out-of-town store network not proving as popular as they once were. They all remain very strong businesses, but the impact that Aldi and Lidl have on the market will continue to be felt by them in 2015. On average, payments in the consumer durables retail industry take 60 days, and we do not expect any significant increase in payment delays in the foreseeable future. 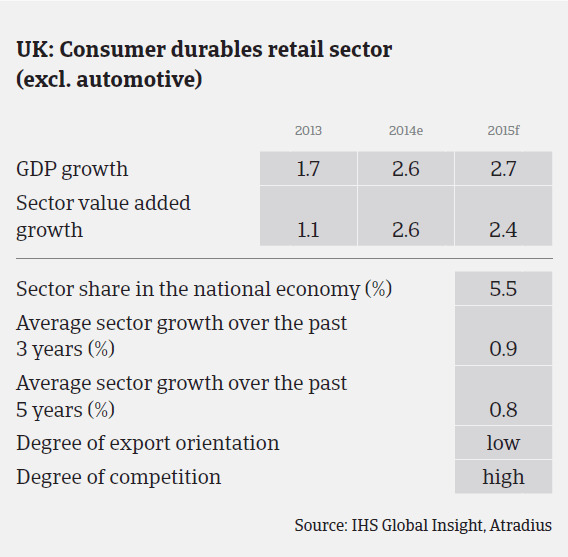 The consumer durables retail sector’s default/insolvency rate is average compared to other British industries, and we do not expect a major increase. However, there are always some retail insolvencies in the immediate aftermath of Christmas, as traditionally this is a time when businesses would fail. Usually, those are retailers that already looked fragile for some time (e.g. loss making stores). There have been high profile retail insolvencies following the Christmas period of 2014 (Austin Reed entering a company voluntary arrangement, CVA, USC and Bank Fashion went into administration). Those business failures are a reminder that the British retail market remains extremely competitive, and changing shopping behaviour, i.e. increasing price sensitivity and a growing share of online retail sales, mean that insolvencies will continue to occur. 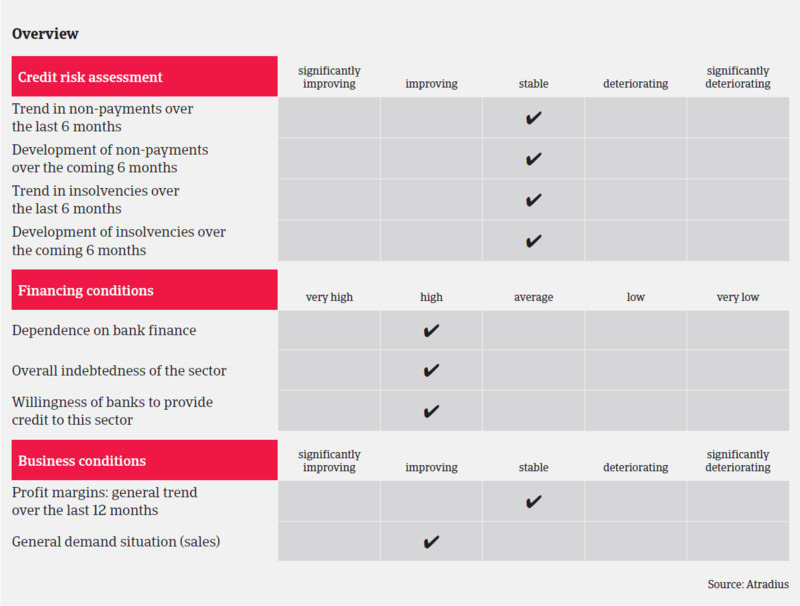 We maintain a cautious approach to underwriting in this area. Retailers have a good awareness of credit insurance and are therefore usually willing to share confidential financial information. This enables us to make the best informed decision. Seasonality is a major factor in the retail sector, particularly around the Christmas period, and we therefore actively encourage our customers to consider seasonal peak requirements well in advance, so that we can ensure we are able to satisfy their demand. Management accounts are generally reviewed on a six month basis, but in more critical cases, these are scrutinised on a quarterly basis.